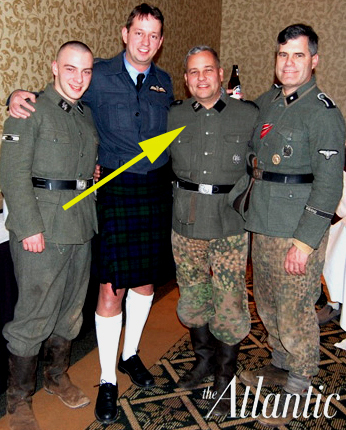 Ohio GOP nominee for Congress Rich Iott likes to dress up as a Nazi officer and run around with other weirdos in the woods on weekends. But don't worry, he has only a "purely historical interest in World War II." I've always been fascinated by the fact that here was a relatively small country that from a strictly military point of view accomplished incredible things. I mean, they took over most of Europe and Russia, and it really took the combined effort of the free world to defeat them. From a purely historical military point of view, that's incredible." Yeah, that's pretty incredible alright. Iott told The Atlantic that he initially joined Wiking "as a father-son bonding thing." And he even had a nom de guerre, Reinhard Pferdmann, to make his war criminal role playing even more authentic. What do actual historians say about Wiking, and the SS unit they re-enact? Retired professor Charles W. Sydnor, Jr. told the magazine, "These guys don't know their history. They have a sanitized, romanticized view of what occurred." No kidding! He added, "If you were to put on an SS uniform in Germany today, you'd be arrested." Interested in playing Nazi on the weekends with a bunch of assholes? Then watch this Wiking recruitment video!